One of my many concerns when I moved to Yokohama from Tokyo was if I would still be able to get any gardening supplies if I needed. Back in Tokyo I lived very close to a discount department store that had a very nice gardening section, also I knew a couple of other places where I could find cheap plants, it was all I needed back then, so I wondered if I would be able to find anything at the new place. So when I moved here it was a very nice surprise to find out that, very close to my new house in Yokohama, there was a garden center. 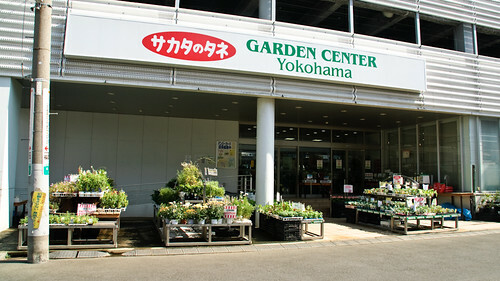 And not just any center, it is the main office for "Sakata no tane" one of the biggest gardening companies in Japan. 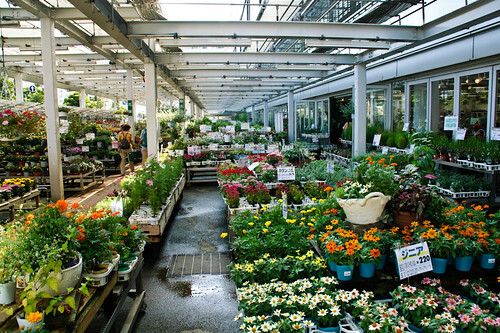 This garden center is big, something very rare in here where all business usually have a lot of space limitations. It is divided in three buildings. The smallest is for parking lot and storage and on the middle size building they have pets. They mostly have fishes and birds, but it is very fun to walk there and see. The last building is the biggest, they have all the gardening related products there. It is basically a big room where all the equipment are on display plus an open greenhouse attached where all the flowers and most plants are. They usually set the seasonal vegetables or fruits and the sales on display at the secondary entrance, and the flowers on the front door. Besides that there is a seeds corner, and some seasonal bulbs or vegetable products (like the tulips), also many different kinds of soil and fertilizers, several aisles for pots and planters and some displays for miniature plants. They also have one section only for orchids, a little corner for bonsai, a room for indoor plants, a corner for mountain plants, books and many, many other things. The garden center is one of my favorite trips whenever I feel like stretching my legs, its just a couple minutes away by bike. I usually go a couple times a month, just to see what they have. If you like gardening and you are ever in Yokohama be sure to pay a visit, there is a lot to see even if you don’t buy anything. I find it very interesting to see how they do gardening here in japan, most things are very familiar but they do have some differences that are nice to see. Wa, very nice! The garden centre I used to like to go to near my house wasn't nearly as big, but I do remember balancing a decent sized ficus tree on the seat of my bike once. How nice to live so close to the garden centre. I also like to take trips to see what's on offer at garden centres or nurseries. We have quite a few to choose from which are close by but some are better than others. I will make a new trip this weekend, i hope is sunny, and that they have strawberries out! Wow this is great! i came across ur blog while searching for where to buy plants in tokyo! Any shops in Tokyo you'd recommend for a wide range, ive been searching to no end for asparagus fern plants? Garden center sounds like it might have it though! hi there... do you know which train to go to nearest sakata no tane garden center from tokyo,please if you have any information,your answer means alot to me thank you.